Who doesn’t love Lino printing? This simple technique can be mastered in a day! 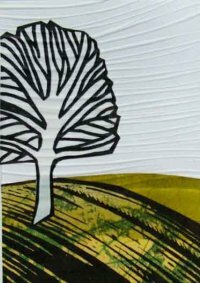 Revealing all her secrets of cutting, registration and printing artist Sally Hirst will lead you through from one simple one layer print, to a reduction printing using more layers, and adding collage to add colours and pattern. You will go home with a pile of lovely prints and ideas for many more. This workshop is particularly aimed at beginners but suitable for anyone who wants to explore ideas and techniques.